Do you have clothing, fabrics, shoes, or other textiles that no longer “spark joy” in your life? If so, please Marie Kondo your homes over the next month to Reduce, Reuse, and Recycle those items while raising money for next year’s 5th grade overnight camp outdoor education program on Bainbridge Island. 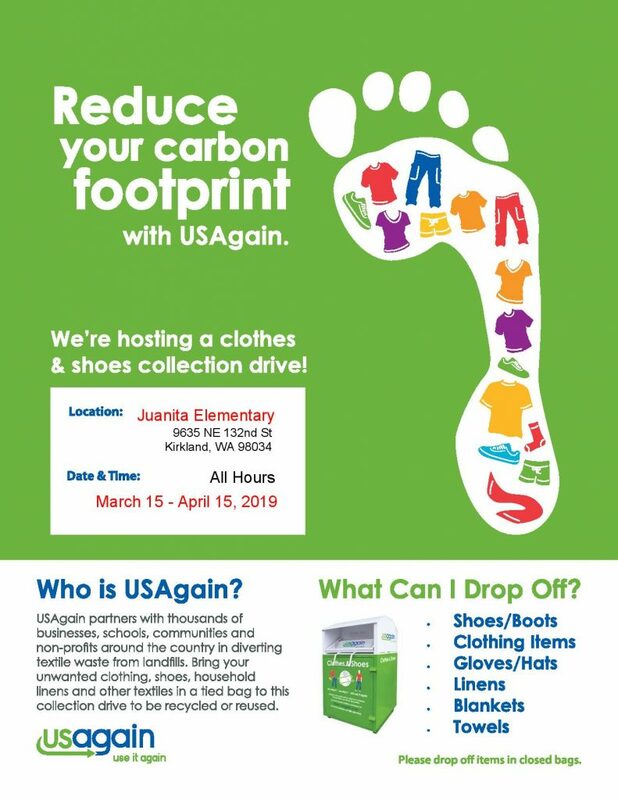 March 15 – April 15 we are competing in a National Earth Month Clothing and Textile Drive competition where the top 3 schools from each state win cash prizes for their school. Currently there are only 26 schools in Washington competing, so we have a decent chance of coming in as one of the top 3! 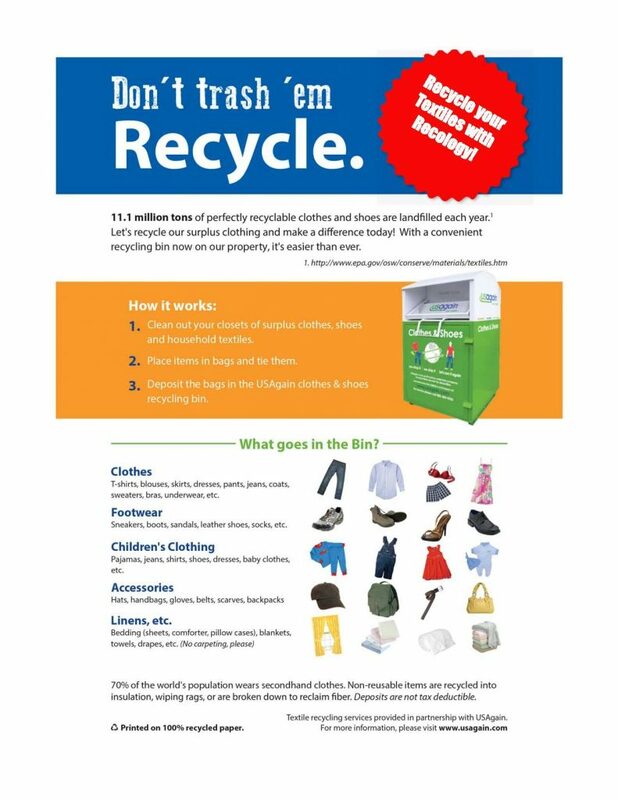 If each student brings an average of 3 – extra large trash bags full of clothing, fabrics, and textiles (including worn shoes), we can reach our goal of collecting over 10,000 lbs! 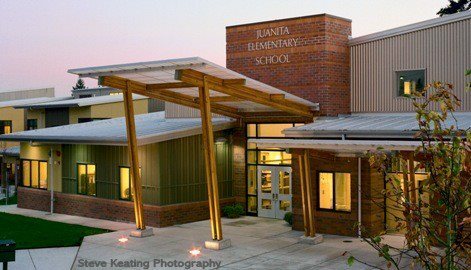 This Friday there will be large “usagain” bins in front of the school to deposit your items. Enclose all items in plastic bags before placing in collection bins. Please see the attached flyers to learn more. Spread the word to all your friends and family! 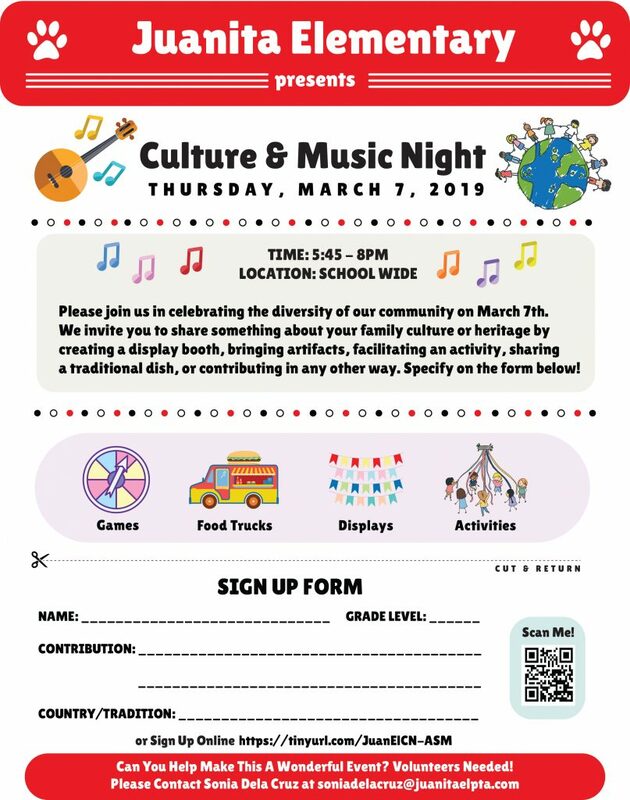 Culture and Music Night: Please join us in celebrating the diversity of our community on March 7th from 5:45-8:00PM. We invite you to share something about your family culture or heritage by creating a display booth, bringing artifacts, facilitating an activity, sharing a traditional dish, or contributing in any other way. Sign up here! http://tinyurl.com/JuanElCN-ASM We will have Super Gyros, Tacos El Guiero and Piroshky Piroshky food trucks onsite throughout the entire event! . Comments Off on Culture & Music Night Thursday March 7th!